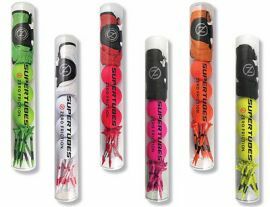 Zero Friction Super tube Pack, 10 Tees, 3 Balls, 1 Glove. The Spectra line is a high quality 2 piece distance ball finished in 6 matte colors: White, Lime, Red, Lemon, Orange and Fuchsia. ƒ? ?We are thrilled to add the Spectra series to our product portfolio,ƒ? stated National Sales Director, Joseph Jung. ƒ? ?The matte finish balls blend perfectly with our color patterns in gloves and tees.ƒ? The new Spectra Supertubes which holds 10 tees, 3 balls and a matching one size compression-fit glove.